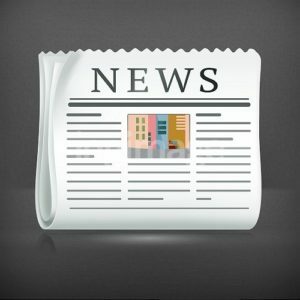 Articles published about Project 1590. Check out Each project to get updated information. 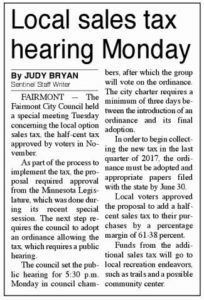 FAIRMONT – The Fairmont City Council unanimously approved an ordinance on Monday to create a half-cent sales tax starting Oct. 1. City voters approved the local option sales and use tax in the November general election by a percentage margin of 61-38 percent, with funds earmarked for local recreation amenities such as parks and trails and a possible community center. As part of the process, the tax had to be approved by the Minnesota Legislature, followed by a city ordinance. The council vote followed a public hearing during which no one spoke for or against the ordinance. The city must notify the Minnesota Department of Revenue by June 30 in order to start collecting the tax on Oct. 1, the start of the new quarter. 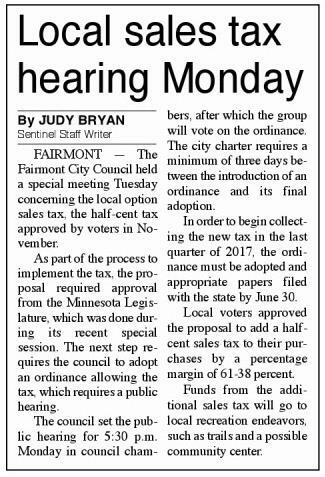 The state will collect the tax which will be generated through the sale of goods and services from Fairmont businesses. The half-cent tax is effective for 25 years, until Dec. 31, 2042, or until the amount of $15 million is collected. In another financial matter, Bill Fahey of Northland Securities, the city’s bond representative, reported the successful sale of about $3 million in improvement bonds for the Margaret Street reconstruction and the city’s portion of the Highway 15 project. “We did extremely well. We saved the taxpayers a lot of money,” Fahey said. Because of the city’s “Aa3” credit rating, five bidders vied for the bonds, with United Missouri Bank of Kansas City coming in with the lowest net cost. Fahey explained that the bond process and Fairmont’s good credit rating resulted in $74,000 in extra funds being added to the construction fund. Turning to other business, the council approved permits for three events at the Winnebago Avenue Sports Complex: the Cardinal Power Girls Fastpitch Softball Association tournament July 7-9; the Faber’s Plumbing softball tournament Aug. 4-6; and the fifth annual “Play 4 a Cure” softball tournament, sponsored by Hawkins Chevrolet, Aug 11-13. Temporary overnight camping also was approved for the Hawkins tournament. In personnel matters, the council was introduced to Officer Jason Christenson, the newest member of the Fairmont Police Department. City employees recognized for years of service included: 10 years – Michael Heckman, Dustin Schwebke, Diane Theobald; 15 years – George Pierce; 20 years – Travis Goerndt, David Hinz, James Kotewa, Kevin Thate, Eric Tonder; 25 years – Brad Buhmann, David Schiltz; 30 years – Theodore Fisher. q Demolition assistance reimbursement at 50 percent of the actual cost, up to $5,000, for Mike and Shawna Hannaman for their property at 416 E. Blue Earth Ave.
q The appointment of Amy Long, administrator of Mayo Clinic Health System-Fairmont, to the Fairmont Economic Development Authority, effective July 1. She will replace Tom Lytle who has served the maximum of 12 years on the board. q A donation of $1,500 to Light, Noise and Smoke, the Fairmont fireworks. This year marks the 24th year that the Fairmont Firefighters have undertaken the responsibility of the July 4 fireworks display. q A permit for a “tractorcade” parade on Aug. 19. Tractor owners will be participating in their annual “Support the Troops” tractor ride from Ledyard to the Martin County Fairgrounds, through Fairmont and back to Ledyard. q An amended ordinance relating to rural and urban service districts in the city. Rural districts are unplatted tracts of land within the city that have not been developed for commercial, industrial or residential purposes. Because they don’t benefit from municipal services, these lands qualify for a lower tax rate. The districts are reviewed annually. Progress update on the source funds for our future community center. Article courtesy of the Fairmont Sentinel. Residents in Fairmont have been letting their ideas for the community be heard as part of a larger effort looking at the future of the city. Last year, Project 1590 started as a grassroots effort looking at bringing a community center to town. Board of Director for Project 1590 Steve Hawkins says, “Get a community center started in our community, and so when we looked at that, we thought is that really what the community wants. After their first meeting in July 2014, members surveyed residents to find out what they wanted to see. From all those ideas submitted, it was narrowed down to just ten, including looking at vacant buildings like this one. Starting this fall, the Reuse and Reimagine Committee will be conducting a city–wide survey looking at building conditions. Besides the big properties like the empty K–Mart building, they will also look at residential properties for the windshield survey. They will take that information and work with the city on options. Project 1590 is also considering other ideas like growing the business community, expanding bike and walking trails and a community center. But a lot of the work is credited to the community for helping the project out. Project 1590 is currently looking for people in Fairmont who can volunteer to help with the citywide windshield survey, for more information, visit https://project1590.com/ or call Tim McConnell 320-761-1682 or email sundogtkm@gmail.com. FAIRMONT – Voters can select up to seven items from the top 30 ideas for Project 1590. Voting can be done online at www.Project1590.com, with one ballot allowed on each electronic device. Paper surveys and ballot boxes are located at HyVee, Fareway Foods, Fleet & Farm Supply and the Martin County Library in Fairmont. Voting ends April 30. In random order, the top 30 ideas are: – A community center or multipurpose facility, including a senior center and other amenities. – An indoor hockey center for year-round use. (Could be part of a community center.) – More restaurant options. – A program to revitalize neighborhoods and clean up blighted property. – New industry to foster job creation and support existing businesses. – Redevelop our health care industry. – Clean up, remove or reuse vacant commercial buildings. – Develop and strategically promote more recreation on our lakes, such as rentals and resort-like activities. – Expand Presentation College or add another post-secondary education campus. – Create festivals throughout the year, such as outdoor concerts, a pork festival, summer parades or a winter carnival. – Revitalize our historic downtown, making it a destination with retail, a bistro or micro-brewery. – Expand the current bike/running trail system around the lakes to create one continuous system. – Enhance our retail environment with new stores. – Improve the quality of our lakes by managing the odor, clearing the shoreline, cleaning the beaches or stocking with game fish. – Build a drive-in movie theater or create outdoor movie nights with large portable screens. – A teen/youth center with year-round activities such as trampolines or laser tag. – Community-wide Wi-Fi. – Make a safer community through neighborhood watches. – Create more activities at the Martin County Fairgrounds. – Develop resorts, cabins or campgrounds on the lakes. – Expand and enhance the aquatic park through longer hours, more slides and other activities. – Have food trucks in Gomsrud Park on evenings and weekends in the summer. – A roller skating rink. – Improve city entrances with signage and landscaping. – A shooting and archery range. – A water park hotel by the Interstate. – Make Fairmont the City of Trees by creating a boulevard tree planting program, remove dead trees and replant new ones. – Enforce current city codes which will improve the appearance city-wide. – Repair rough roads and improve/maintain our infrastructure. � Copyright 2015 Fairmont Sentinel. All rights reserved. This material may not be published, broadcast, rewritten or redistributed. FAIRMONT – The final round of balloting for the top ideas for Project 1590 opens today and continues through April 30. Voters can select up to seven ideas from the top 30 suggestions. “We’re limiting the number of choices so people make a serious consideration,” said Steve Hawkins, chairman of Project 1590’s board of directors. “We want people to prioritize because only five to 10 (ideas) are going to make it. We want to know, for sure, what ideas people think are most important. Voters can make their selection online at www.project1590.com. “You can vote once per electronic device,” Hawkins said. “For the whole family to vote, we recommend that you either turn in paper surveys or use individual cell phones.” Paper surveys are printable off the website. Copies of the survey and drop boxes will be available at HyVee, Fareway Foods, Fleet & Farm Supply and the Martin County Library in Fairmont. Project 1590 is a grassroots community enhancement project that began last summer. Members of its steering committee, representing a cross-section of the local demographic, gave presentations to local churches, organizations and businesses while collecting ideas from those meetings. Idea collection boxes also were placed in stores and offices. By the Nov. 15 deadline for idea collection, people had contributed 1,686 ideas they felt would make Fairmont even better. An intern in the urban studies program at Minnesota State University-Mankato was hired to combine and condense those ideas into 75 topics. A round of public voting ending Feb. 18, with 1,700 ballots submitted, narrowing the suggestions down to the top 30. After the top five to 10 ideas are determined by the final round of voting, committees will be formed to spearhead their development. Some might come about quickly, while others will take a longer time and effort. Hawkins said that don’t make to final cut will be forwarded to the appropriate entity. “There are items that can be incorporated with an existing idea,” he said. “We hope that if people are passionate about something, they’ll step forward. We hope other organizations will see some of these smaller ideas, will take on an idea and bring it to life.” He is unsure of how many “big” ideas ultimately will be decided, hence, the “five to 10 range” he often mentions. In most voting, there usually is a obvious gap between categories, Hawkins said. This marked difference in poll numbers will be the cutoff, but there will be a minimum of five major projects. The top selections will be announced to the public at a “big reveal” to be held in mid-May, Hawkins said. “I’m hoping this whole process – building a grassroots program – will show people that you can do this,” Hawkins said. “Go ahead, and get it going. We’re all trying to enhance the quality of life in this community.” Project 1590 steering committee members, as part of the ongoing fundraising for operational expenses, will be working at McDonald’s from 5-8 p.m. Wednesday. The Fairmont restaurant will donate 10 percent of their sales during those hours to Project 1590. Steering committee members will be clearing tables and answering questions about the program. Paper surveys also will be available. FAIRMONT – Hannah Rybak, a 23-year-old graduate student at Minnesota State-Mankato, now serves as a paid temporary intern for Project 1590, a grassroots community enhancement project initiated last summer. Project 1590’s steering committee, a diverse group of Fairmont residents, recently hired her to sort and categorize almost 1,700 community improvement ideas the committee spent several weeks gathering from local citizens. “Being from New Prague, I can identify with a small town. Even though I’m not from here, I can draw a lot of parallels,” Rybak said. In May, she earned a bachelor’s degree in urban and regional studies with a minor in public administration.from MSU, where she held a 3.71 grade-point average. She remains at the college, working on her master’s degree in urban and regional studies. She was one of three graduate students recommended for the job by the dean of the department. Rybak previously served internships in the city planning departments at New Prague and Fridley. She was mainly responsible for code enforcement, surveying for violations and researching and drafting new codes. She credits those internships with honing her analytical, organizational and research skills. She spent about a week sorting through the ideas for community improvement gathered by the steering committee. Rybak will invest at least 210 hours during her internship, following the streamlining of all the ideas from 1,500 to the top 100, to the top 30, and finally to the top 5 to 10 ideas. “This is really a unique opportunity for me to put everything I’ve learned in school to use,” she said. FAIRMONT – Project 1590 made its debut this summer when a diverse group of Fairmont residents formed a steering committee with the aim of improving the community. Over several weeks, citizens of all ages and all backgrounds and interests submitted almost 1,700 ideas of ways to enhance the livability of the city. The steering committee recently hired Hannah Rybak, a student at Minnesota State-Mankato who is working on her master’s degree in urban studies. Rybak’s responsibilities for Project 1590 focus on categorizing and organizing the collected ideas into various categories for public voting. According to Steve Hawkins, who spearheaded the Project 1590 effort, the first round of public voting will begin Jan. 8 when the top 100 suggestions eventually will be winnowed down to the top 30. Rybak and the steering committee are working through the design of the survey, but there will be an electronic form and paper form. “By the end of February, the first round of the survey will be complete,” Hawkins said. The 30 most popular ideas from the first survey will be subjected to a second public poll to determine the top 5 to 10 ideas. “Then the real work starts,” Hawkins said. Committees will be formed to bring those ideas into reality. A formal board of directors for Project 1590 has been formed, a requirement for the effort to obtain a non-profit status for grants and tax-deductible donations. Currently, there are seven board members who will meet Jan. 12 to elect officers and continue to work on bylaws for the group. Board members are Hawkins, Dr. Lael Luedtke, Dr. Rufus Rodriguez, Adam Smith, Moni Harper, Ann Tehrfer and Marty Krause. Steering committee and board members continue to make presentations to various groups and individuals in the community in an ongoing effort to raise startup funds for surveys and marketing. The steering committee meets noon Thursdays in room 112 in the SMEC building (Presentation College). The meetings are open to all interested persons. For more information, contact Hawkins at (507) 399-1615. The “Big Night of Ideas” is scheduled for Oct. 8 in Fairmont at Five Lakes Centre. It will run from 5:30-7:30 p.m. The event is part of Project 1590, which is a local effort to assemble 1,000 ideas for enhancing the quality of life in Fairmont. This mass of suggestions will be winnowed down by local citizens over the coming months. The end goal: Get down to 5 to 10 ideas by May 1. Committees will then form to put these ideas into action. What’s an idea look like? How about “Bacon Fest” to promote the pork industry here? Or beautification efforts? Or better streets? Got your own? Get it in. FAIRMONT – With a goal of collecting 1,000 ideas for enhancing life in Fairmont, Project 1590 has reached the half-way point. It is planning an event, dubbed “Big Night of Ideas,” to help hit the desired number. It will take place 5:30-7:30 p.m. Oct. 8 at Five Lakes Centre. Project 1590 is a grassroots community enhancement project that began this summer. A steering committee has been meeting weekly for brainstorming sessions. Committee members have given presentations at local churches, service clubs and coffee groups, while collecting ideas from those meetings, as well as at local sporting events. Idea collection boxes also were placed in stores and offices. The Big Night of Ideas is being coordinated by Heather Hawkins and Judy Walders, members of the steering committee. And it’s free with the submission of one idea. “No matter how big or how small, your idea will be passed on,” Walders said. So far, the list of ideas is as diverse as the population of Fairmont: a teen center; various retail businesses and eating establishments; beautifying the State Street median with flowers and decorations; rehabilitating homes; a multi-generational center; street repairs and improvements; a sidewalk policy; campgrounds on the lakes; mini golf; a “Bacon Fest” to promote the county pork industry; and even a suggestion to change the attitude of Fairmont residents so they won’t be afraid to take risks. The deadline for the idea collection process has been set for Nov. 15. The Project 1590 steering committee is in the process of hiring an intern to oversee the idea condensation process. Public voting for ideas will run from Nov. 15 to Dec. 31, when the top 100 will be announced. From Jan. 1 to Feb. 28, public voting will reduce the number of ideas to 30. The final round of public voting to condense the number of ideas to the top 5 to 10 will take place from March 1 through April 28. After the top ideas are determined, committees will be formed to spearhead their development. Some might come about quickly, while others will take a longer time and effort. “This (Big Night of Ideas) will be a channel to a better community,” Hawkins said. “It’s going to be important. Even if it doesn’t make the top 10, your idea still counts. We’re going to get it to the right place. © Copyright 2015 Fairmont Sentinel. All rights reserved. This material may not be published, broadcast, rewritten or redistributed. FAIRMONT – If you haven’t yet heard about Project 1590, you’re not alone. But within the next several weeks, area residents will become very familiar with the endeavor. Project 1590, which refers to Fairmont’s location at the intersection of Highway 15 and Interstate 90, is a grassroots community movement that began growing earlier this summer. “It’s anything to do with enhancing the life and well-being of the citizens of Fairmont and our surrounding communities,” said Ruth Cyphers, a member of the steering committee. The group’s goal is to gather ideas from the community, narrow down the list, and then let the community vote on what it would like to see added to Fairmont’s current assets. Over the next several weeks, steering committee members will explain Project 1590 and gather ideas at service clubs, coffee groups, church groups and other community gatherings. If you’re not part of any of those groups, a public “big night of ideas” is scheduled for 5:30 p.m. Oct. 8 at Five Lakes Centre. “We don’t want to exclude anybody,” Hawkins said. Project 1590 has a Facebook page on which people can post their ideas. A website also is in the developmental stages. All ideas will be taken and included in the project. Do not limit your ideas for any reason – not for location, cost, population or any other issue. Ideas can be anything from bricks and mortar to programs and processes. No negative comments regarding anyone’s ideas are allowed. The steering committee already has garnered about 170 wide-ranging ideas: a community center with specific features; a Target store; rejuvenate the downtown area with coffee shops, cafes, a brewery/pub and retail shops; a claim to fame like the world’s largest corn maze; a “Taste of Southern Minnesota” with food vendors and live music; a pig/bacon festival; beautifying the Highway 15 entrance to the city; more “mom” stores in the mall; a place to buy lumber and building supplies on weekends. “The neat thing about this is that it’s a grassroots effort,” Cyphers said. Once the 1,000 ideas are gathered, public voting will pare down the number to the top 100, then the top 30, and finally the top 5 to 10 ideas. 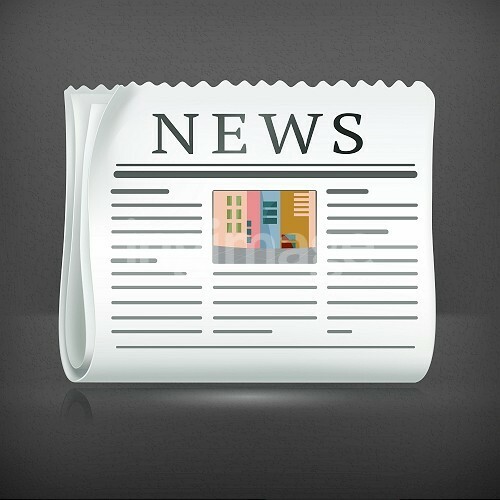 A May 2015 target date has been set to identify the top ideas. Committees will then be formed to begin working on the various projects and funding sources. The concept might seem overwhelming, but Cyphers and Hawkins are confident progress will be made. As an example, they used the improvements made in Austin, Minn., with its similar project, Vision 2020, which involves 20 projects by the year 2020. “If you don’t want to risk failure, do nothing,” Hawkins said. Buy your tickets now and support the new mini golf course coming soon!We are excited to be partnering with Fairmont Early Risers Kiwanis for the next All You Can Eat Pancake Supper on May 6th!